David Coulthard is attacking the 2001 World Championship season with even more confidence and assurance than he has mustered before. This, he believes, can be his season. Yet this mind-set reflects no fundamental change of emphasis on the part of the 29-year-old Scot - nor a strategic shift in his sense of on-track priorities. He is a man at peace with himself, with a shrewd, but not obtrusive, sense of his own values. He knows that he has earned and retained his place in the McLaren-Mercedes squad on merit. "I am proud of the fact that - despite the many doubters - I am an established part of the McLaren family," he told RACING LINE , the TAG McLaren group monthly magazine. 'Everybody knows Ron Dennis and the McLaren team well. They are not running a charitable institution. They want to win. And I want to continue being part of that process." Nevertheless, David fails to apologize for the fact that his reserved, slightly formal nature hardly matches up with the romantic, extrovert, Boy's Own paper image of a racing driver. "I'm sorry if I don't conform to some people's ideas of how they would like me to be," he says with the delicate flicker of an ironic smile. "But this is me and that's all there is to it." He also sustains a resolute determination to win the World Championship. He was disappointed to be written out of the 2000 title equation, but has the resilience to bounce back and try again. "I will just have to focus on it all again next year," he says, looking forward to 2001. "That is what I came into Formula 1 to achieve and see no reason why I should not realize that ambition." David continues to enjoy a well balanced and mature relationship with his colleagues in the West McLaren Mercedes team - including his team-mate Mika Hakkinen. "Despite the fact that I can virtually look from my balcony here in Monaco to Mika's balcony," he admits, "we don't live in each other's pockets, we live very separate private lives, so we effectively only spend 17 weekends together - which is true of the mechanics, Ron and all the engineers. "Mika and I have a relationship which has developed over the years. Although we're not phoning each other up and going out for a beer all the time, if we do meet up we certainly don't sit at opposite ends of the bar or restaurant. It usually ends up as a long and enjoyable evening together!" "Despite having a very a long and happy relationship with McLaren, there are always bound to have been moments of frustration and the very nature of the F1 business is such that you are always kept on your toes and can never quite relax," says David. "Even people like Michael Schumacher, who has won three World Championships, would appear occasionally to have some insecurities. You might wonder why somebody who is perceived as one of the best drivers in the business have any insecurities? But he does! So that's Formula 1 for you!" So does David ever have any insecurities? "No," he grins. "But I have frustrations. Frustrations between how I see myself and how some other people in the business see myself. There sometimes seems to be a big divide there. 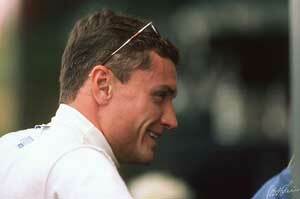 "I am still very, very hungry for success and that's one of the great benefits of racing for McLaren. After all they have achieved, you might, I suppose, have expected Ron and Mika, for example, to have eased back slightly. But there is no hint of that and, since I still regard myself as highly motivated. "I don't see myself getting old and unambitious. Not for some while!